BLOOMINGTON, Minn. – When you talk with the teammates and coaches of New England Patriots running back Rex Burkhead about what makes the 27-year-old so valuable, you're not going to hear about his 264 yards rushing this season. You won't hear about his 254 yards receiving, either. You won't hear about his eight touchdowns. You'll hear about a player whose versatility and egoless mentality made him an ideal fit for the Patriots when they signed him to a one-year deal before this season. "Rex can do everything," said fellow Patriots running back Dion Lewis. "He plays special teams, runs the ball, catches the ball and he can block. He can do everything, kind of like a Swiss Army knife. He can run routes as a receiver out of the backfield as well, blocking punts, whatever." "We have a group of versatile backs," said fellow Patriots running back James White. "Rex just comes in ready to work, really doesn't say too much like myself – tries to get all the coaching points then go out there on Sunday and do his job." Even Patriots head coach Bill Belichick gushed about Burkhead. "Really is a four-down player. He can play on first, second, third and fourth down at a good level. And those players are hard to find in the National Football League. He's a very reliable, dependable player." "Rex, he's a special person," said Andy Hoffman, an attorney who lives in the small town of Atkinson, Neb., three and a half hours northeast of Lincoln, where Burkhead starred for the Nebraska Cornhuskers. "My wife and I often wonder: Is he human, or is he an angel?" You may remember this story from Burkhead's college years. When Burkhead was a junior at Nebraska, he was one of the best running backs in the country, rushing for 1,357 yards and 15 touchdowns. That season, Hoffman contacted the school about trying to get an autograph for his five-year-old son, Jack. Burkhead was Jack's favorite player. Earlier that year, Jack had surgery on a brain tumor. The entire summer, Jack suffered from seizures. The family traveled to Boston Children's Hospital for another opinion on the tumor that was still growing inside his brain. The neurosurgeon told the family they could operate a second time, but there were risks: Jack could have a stroke. Or Jack could never wake up. So the family compiled some bucket list items for Jack, and one of them was to meet his favorite athlete. The family drove to Lincoln and walked into Memorial Stadium on a Thursday, two days before the Huskers were scheduled to play the Washington Huskies. Hoffman expected they'd just meet Burkhead for a quick photograph. Instead, Burkhead gave the family a tour of the weight room, the locker room and the stadium. On the field, Jack asked Burkhead to race. They raced down the field, side by side. They gave Burkhead a bracelet – "TEAM JACK PRAY" – and Burkhead promised he'd wear it during that Saturday's game. He did, and the Huskers won. One week later, the Hoffmans traveled to Boston for the surgery. Before the surgery, Burkhead called Jack to tell him he was praying for him. That Saturday, the Huskers were playing a prime-time home game against Ohio State. The Huskers mounted a huge comeback and won. On Monday, Jack had his surgery. The next day, with Jack's head swollen like a balloon, Burkhead called him in the hospital. "Rex told Jack he'd helped inspire that comeback against Ohio State," Scott Hoffman recalled. But this wasn't just some quick feel-good story. The relationship between Burkhead and the Hoffmans has continued in the seven years since. "It went from Jack being Rex's little buddy to Jack being a de facto member of the team," Hoffman said. During the 2013 Nebraska spring game, Burkhead arranged for Jack to suit up in a Nebraska uniform and run for a touchdown in front of a crowd of 60,000 people. The Hoffman family was invited to the White House to meet President Barack Obama; Burkhead joined them. 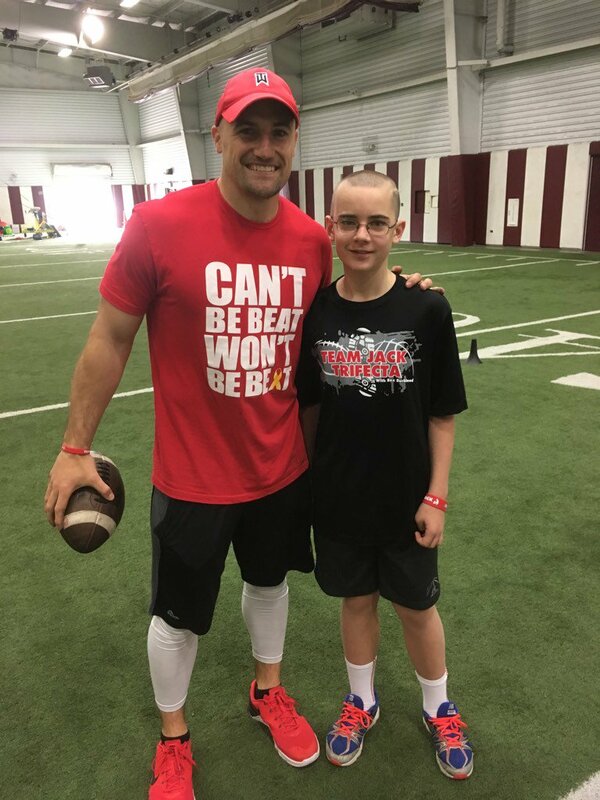 Then Burkhead helped launch the Team Jack Foundation to raise money for pediatric brain cancer research. The relationship between Burkhead and Jack continues today. Burkhead is on the board of directors for the Team Jack Foundation. The foundation will host its fifth gala on Feb. 24, and Burkhead will be there. He's holding a separate fundraiser in his home state of Texas in the spring, too. Jack is doing well, relatively speaking. The tumor is still there; doctors say it's "enhancing" but not growing. He's 12 years old now, a middle schooler who plays basketball in winter, baseball in the summer and football in the fall. The main side effect of the tumor is that it has made him an epileptic. Two years ago, he had a grand mal seizure. Since then, he's had seizures – usually smaller ones – once a week. "We take the good with the bad, and the good outweighs the bad by a mile," Hoffman said. "We're not out of the woods with the cancer. He could be back in chemo in the near future. But he's enjoying life in the woods." Burkhead is preparing for his first Super Bowl this week, but Jack is never far from his mind. The two have a fun relationship; Jack loves to burp directly in Burkhead's ear when they see each other. Burkhead plans to call him before the Super Bowl; he plans to call him after. It's as if meeting Jack gave Burkhead perspective on his own life. "Just meeting him for the first time, I saw the positive attitude he had even though he knew he was fighting for his life," Burkhead said Wednesday at one of the press conferences in advance of the Super Bowl. "So anything going on in my life, it put it in a whole different perspective." He'd been texting with Jack's family the night before. The families have gotten so close that the Hoffmans consider Burkhead like a son or a nephew. "If there's a day I feel tired," Burkhead said, "or maybe some fear creeps in, I think about Jack in his situation, and that relationship, and it kind of puts those other things to the side. I can do this. This? This isn't bad at all."